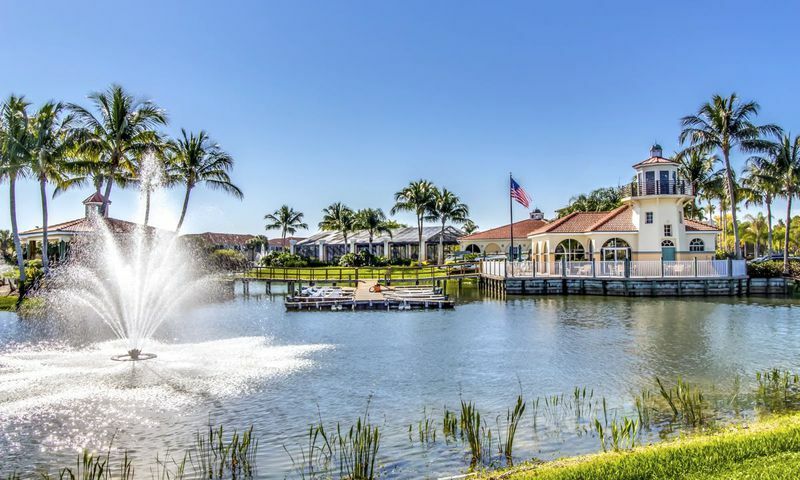 Lighthouse Bay at The Brooks in Bonita Springs, FL is a private lakefront community featuring a 26-acre nature preserve and 13 stocked fishing lakes. This affordable neighborhood is part of a larger master-planned community known as The Brooks. This gated community includes a variety of amenities, such as five swimming pools, six tennis courts, and three miles of walking and biking trails. There are 654 attached homes at Lighthouse Bay, and every one of these homes is set on waterfront property. Lighthouse Bay homes are designed in four distinct styles, and are available in a range of sizes and prices. Residents will enjoy living in Bonita Springs, which is located just north of the popular city of Naples. The area surrounding Lighthouse Bay is a gulf coast paradise, with many shopping, fishing, boating, and other recreational attractions. Lighthouse Bay is a resort-style community open to all ages which features an excellent collection of amenities. Residents at Lighthouse Bay can enjoy all of the activities offered through the community’s Harbor Club and Spa. Here, residents can make use of the well-equipped fitness center, saunas, card rooms, and meeting space. Outdoors, the amenities include bocce ball courts, a half-court basketball, six Har-Tru tennis courts and three miles of walking and biking trails. The community also features a private sunning beach and a 26-acre nature preserve. Ample open spaces let residents enjoy such outdoor activities as bird watching. Those who love the water will instantly feel at home in Lighthouse Bay. Thirteen stocked fishing lakes are scattered throughout the community, providing water views for every homeowner. A marina and boathouse offers paddle boats, row boats, and canoes. In addition, there are five swimming pools, including a screened lap pool and a lagoon-style pool. Residents at Lighthouse Bay may also use the amenities at The Brooks Commons Town Center. The Brooks Commons Town Center features a fitness center, Rosie Spoonbill's Restaurant, community enrichment center, The Village Green, convenience stores and specialty shops and a private beach club. The beautiful homesites at Lighthouse Bay feature attached homes with water views and their own lanais. There are four types of attached homes available: Garden Condos, Coach Homes, Courtyard Villas and Carriage Homes. Potential residents can find affordable living within this spectacular community beginning with Garden Condos. These thoughtfully designed homes range in size from 1,250 to 1,364 square feet and include two bedrooms, two bathrooms, and detached carports. For those who need a bit more room, Coach Homes provide 1,354 to 1,646 square feet of first or second-floor living. Each Coach Home features three bedrooms, two bathrooms, and a detached one-car garage. Courtyard Villas are duplex homes that feature two to three bedrooms, two bathrooms, and an attached two-car garage. These attached villas are available in three different floor plans and range in size from 1,786 to 1,956 square feet. These homes feature cozy courtyards and optional swimming pools. With floor plans ranging from 1,806 to 2,354 square feet, Carriage Homes are the largest homes in Lighthouse Bay. Carriage Homes offer two to three bedrooms, two bathrooms and attached one or two-car garages. These homes also feature either first or second floor living. The residents at Lighthouse Bay delight in the diversity of a community that is open to all ages, while enjoying resort-style amenities that support an active lifestyle. With so many outdoor amenities, large fishing lakes, and a 26-acre nature preserve, residents have many opportunities to enjoy the beautiful Florida climate. Lighthouse Bay has the added security of a gated community. This makes it ideal for either year-round residents or wintering snowbirds. With 654 homes, this comfortably-sized community has the amenities of a larger resort, but the feel of a more intimate neighborhood. Community events bring residents together and provide activities that appeal to a variety of residents. A full-time activities director is also on hand to help residents make the most of all the community and surrounding area has to offer. Lighthouse Bay is situated in Bonita Springs, just north of Naples. This lovely natural area has become a popular location for both visitors and those who wish to relocate to sunny Florida. There are miles of beautiful beaches, acres of nature preserves, and close proximity to larger cities with many additional recreational attractions. Nearby Naples is a tropical, gulf coast paradise. This popular destination features everything needed for vacation-style living. There are over 35 golf courses, miles of white beaches, and boat charters available for deep-sea fishing. Fabulous shopping opportunities range from small boutiques to large chain department stores. Bonita Springs is also set within 15 minutes of both Bonita Beach and Florida Gulf Coast University (FGCU). The Coconut Point Mall is conveniently located within walking or biking distance of Lighthouse Bay, and the SW Florida International Airport is only a short drive away. With so many resort-like amenities, flexible floor plans, and nearby attractions, residents will be glad to call Lighthouse Bay their home. These amenities are specifically available to residents of Lighthouse Bay. Residents may join The Brooks Commons Club. There are plenty of activities available in Lighthouse Bay. Here is a sample of some of the clubs, activities and classes offered here. Garden condos offer affordable living space ranging from 1,250 to 1,364 square feet. These condos feature two bedrooms, two bathrooms and detached carport for one car. Please Note: Not all floor plans are available at this time. Coach homes are attached units that range from 1,354 to 1,646 square feet with first or second-floor living and includes a one-car detached carport. Please Note: Not all floor plans are available at this time. Courtyard Villas are duplex homes that offer 1,786 to 1,956 square feet of living space and feature courtyards and optional swimming pools. These attached villas have two to three bedrooms, two bathrooms, and an attached two-car garage. Please Note: Not all floor plans are available at this time. Carriage homes are the largest floor plans in Lighthouse Bay and range from 1,806 to 2,354 square feet. Carriage homes feature first or second-floor living space and have two to three bedrooms, two bathrooms and an attached one or two-car garage. Please Note: Not all floor plans are available at this time. I really enjoy living at Lighthouse Bay. I have been here since 2010 and love the area, the community and all the amenities. It's great having everything so close to home. I can walk to the pool, the trails are nice, beautiful landscaping, close to the beach, shopping, restaurants and golf. It's perfect for retirement! 55places.com is not affiliated with the developer(s) or homeowners association of Lighthouse Bay. The information you submit is distributed to a 55places.com Partner Agent, who is a licensed real estate agent. The information regarding Lighthouse Bay has not been verified or approved by the developer or homeowners association. Please verify all information prior to purchasing. 55places.com is not responsible for any errors regarding the information displayed on this website.